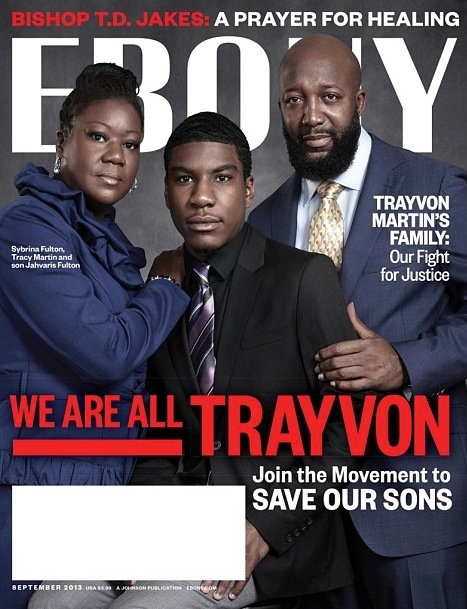 Ebony magazine honors the late Trayvon Martin and his legacy with a cover of his family in its September issue. The photo includes his mom Sybrina Fulton, brother Jahvaris Fulton and dad Tracy Martin. The magazine went one step further by placing several celebrity dads and their sons posing in hoodies on a few more covers for the month. Celebs include Miami Heat player Dwyane Wade and his sons, director Spike Lee and his son and actor Boris Kodjoe and his son. Head over to cottenkandi.com to view the rest of the September 2013 covers honoring Trayvon Martin.